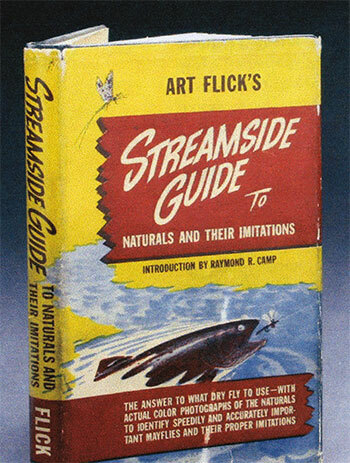 A rare near mint copy of the 1948 first edition of Streamside Guide. Even though thousands were printed, it’s nearly impossible to find one today with a dust jacket. The book was meant to be carried by fishermen, and a loose paper cover was as useless as a dull hook. In the winter of 1943–1944, the Allied advance up the Italian peninsula ground to a halt in the muddy quagmire and freezing temperatures at the foot of the Monte Cassino Ridge, where German forces were entrenched in formidable defensive positions commanding the heights. Bitter fighting from November through May had cost thousands of lives without gaining any ground, and the amphibious landings at Anzio had been contained in a tiny bridgehead by adroit maneuvering on the part of Field Marshall Kesselring. A few American offi116 cers sought a brief respite from the grim stalemate by hunting ducks on the Gaeta marshes, which the Germans had flooded by demolishing dams and dikes on the river Gariglione. The mallards and European Widgeon they brought to bag provided a welcome change from K-rations and “despite a woeful lack of culinary apparatus” some memorable meals were prepared utilizing local herbs and vegetables. A particular favorite was “Cacciatore Gariglione” and one of the officers, Lt. Colonel Raymond Camp, included the recipe when he published “Game Cookery in America and Europe” fifteen years later. The stalemate dragged on until late May when Lucius Truscott’s VI Corps broke out of the Anzio bridgehead and, in one of the war’s greatest missed opportunities, the egocentric General Mark Clark drove his Fifth Army straight into Rome instead of encircling Kesselring’s forces, a hollow victory that enabled the German 10th and 14th armies to retreat to the north and occupy the redoubtable heights of the Gothic Line. Clark was castigated by his superiors for this tactical blunder, but in one of history’s odd quirks, his race for the capital would prove to be serendipitously beneficial to the future of Catskill fly fishing. Field Grade officers were billeted in Roman hotels only recently vacated by their Nazi counterparts, and after partaking of the local Chianti and Grappa one evening, Lt. Colonel Camp was surprised to find that the outside phone lines at his hotel were still operational. When his turn came he set his glass down and dialed the overseas operator. After six months in the country he’d learned enough Italian to make himself understood, so reciting a number from memory he sipped his Chianti and waited for the call to go through. Finally, through the hiss and crackle of the Trans-Atlantic cable, a faint but familiar voice answered at the other end, “Hello, Westkill Tavern”. Camp was mindful of military regulations. “Now look, I’m going to be blunt. I’m going to put it frankly. As he put the receiver back in the cradle there were two thoughts in Art’s mind. One was relief and gratitude that his friend was alive and unharmed, and the other was the sinking realization he really was going to have to get busy and start working on “that damned book.” It had, after all, been nearly a decade since A Book of Trout Flies had been published and it was long out of print and virtually unobtainable. And, truth be told, he had to admit that he had picked up quite a bit of additional information in the intervening seasons on the stream, as well as fine-tuning the fly patterns he now tied for his customers. Whenever he shared these observations with his fishing companions or the regulars at the bar, someone would invariably chide him, only half sarcastically, “Are you going to put that in the book?” Next to Ray Camp, whose harangues he’d thought he’d escaped for a while, his principal tormentor was Chip Stauffer. His friendship with Jennings notwithstanding, Chip was forever importuning Art to put his findings and fishing experiences in print, and Bill Flick remembers his father grumbling about Stauffer’s incessant badgering while reiterating his own lack of enthusiasm for the project. Another frequent Westkill guest who was encouraging him to write it was Angus Cameron, an editor at Little, Brown and Co., who later suggested the title for the book. Although his heart wasn’t really in it, Art knew that his excuses were starting to sound threadbare as A Book of Trout Flies faded in the public mind and its author showed no interest in updating it. In view of the wrath Jennings subsequently directed at Art and his popular little book, it is interesting to speculate that if he had used those years to expand and enhance his original work with better illustrations, for example, there never would have been a Streamside Guide and Art would doubtless have gladly foregone the rigors of authorship to aid his old mentor in this endeavor. 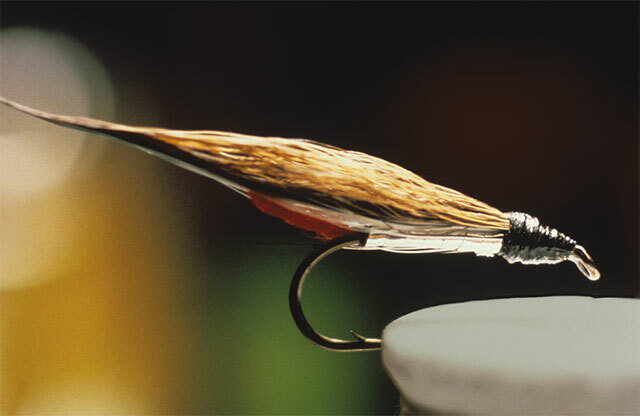 Art modestly insisted that he had originated only two patterns; the Red Quill and the Black-Nose Dace bucktail, shown here. There was another dynamic contributing to Art’s reticence that we don’t stop to consider in this day and age of overeducated outfitters and guides, who often hold the same degrees as their clients and augment their fishing income by writing books and articles on the sport. Prior to the post war boom in higher education, as returning veterans took advantage of the G.I. Bill, American colleges and universities were the prefecture of the upper classes who had authored virtually all of our angling literature up to that time. Ray Bergman was perhaps the sole exception to the rule but he was a professional fisherman, a very rare bird at that time. It can be fairly stated that Art Flick and Jim Leisenring (The Art of Tying the Wet Fly, 1941) were the first truly blue collar American angling authors, and rubbing shoulders with members of the Anglers Club and others of their ilk only made Art more acutely aware of this disparity in backgrounds. Many others, including the author, were amazed at the success of the little book that would find its way into the vest pockets of a whole generation of appreciative fly fishermen. Devoid of the pedantry of previous works, it concentrated on a basic set of fly patterns to cope with the most common eastern hatches interspersed with quaint homilies and entertaining anecdotes that made for good bankside reading while waiting for a hatch. The admittedly rudimentary color photographs of the naturals and their imitations were something altogether new at the time and, despite their shortcomings, were much more useful to anglers than the rather washed out color plates in A Book of Trout Flies. Except for the Red Quill and the Black-Nose Dace, the author did not claim credit for any of the flies and identified Gordon, Steenrod, Chandler and Jennings as the originators of the other patterns, and although he had modified the latter’s flies he gave the original dressings as well as his own variations.